It’s not often that someone submits an Amish Friendship Bread recipe that makes you go, “Wow.” As in WOW. 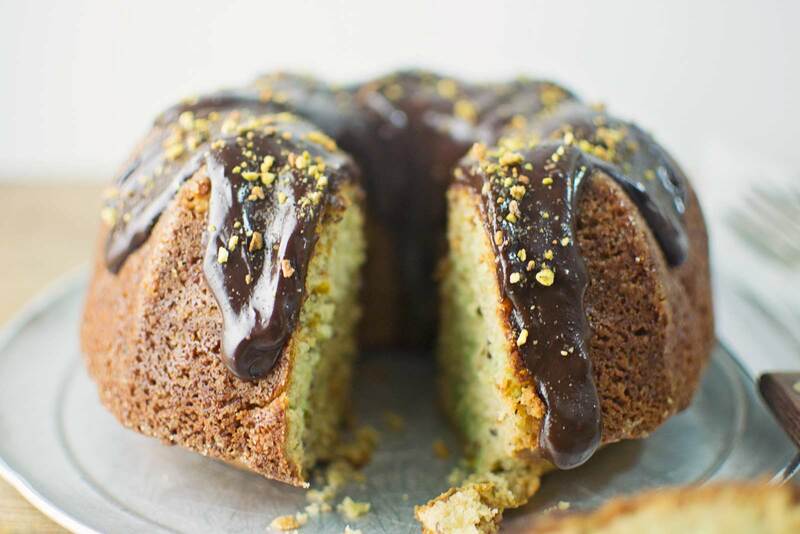 This Pistachio Cardamom Amish Friendship Bread with chocolate ganache does exactly that! This recipe is from the wonderful Stacey Doyle of Little Figgy, also a mother of three and big food enthusiast. She was a part of our 10 Days of Amish Friendship Bread event last year, and has come up with not one but two terrific Amish Friendship Bread variations (the other one will be making an appearance in our Recipe Box later this month). Pre-heat oven to 325° F (162° C). Grease and dust a Bundt pan with sugar and prepare a cupcake pan with four to six baking cups. In a large bowl, mix the starter with the whisked eggs, then add oil, milk and vanilla. Mix well. Add sugar and 1½ cups of the flour. Mix until well incorporated. 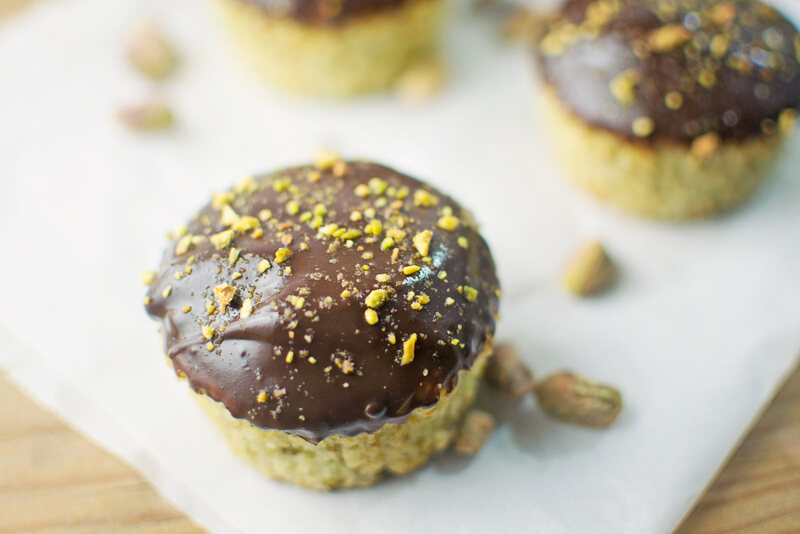 In a food processor, add 1 cup of the pistachios with ½ cup of flour, giving it a good blitz until the pistachios are chopped and combined well with the flour. Add the pistachio blend, baking powder, salt, pudding mix and cardamom to batter, mixing until well combined. Add the lemon zest and, if desired, the lemon juice. Pour the batter into the greased and sugar-dusted pan until ⅔ full. Pour any remaining batter into the baking cups, also filling to ⅔ full. Bake for 50-65 minutes (Bundt pan) or 25-30 minutes (cupcakes) or until a toothpick inserted in the center comes out clean and the top is lightly golden. Remove from pan and allow to cool completely. Chop the remaining ½ cup pistachios in food processor. 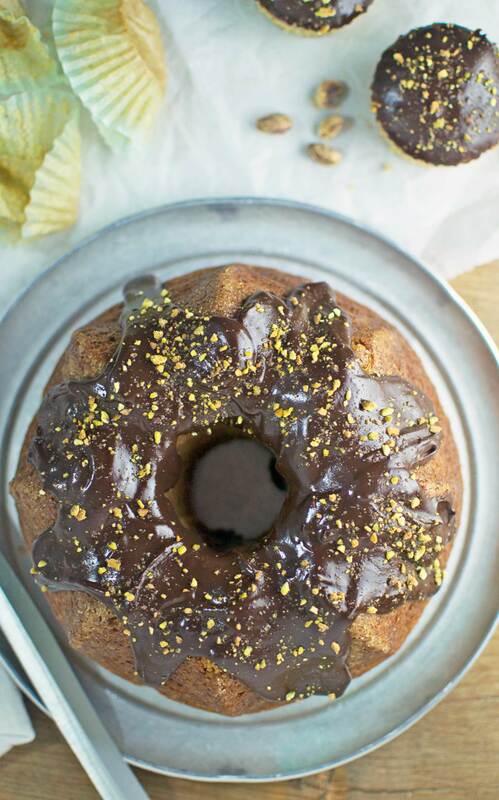 For the Bundt cake, generously spoon room temperature chocolate ganache and allow it to cascade down the sides. For the cupcakes, pull off the paper liners and dip the tops into room temperature chocolate ganache, swirling it around a bit. Top with well-chopped pistachios. You can visit Stacey at her website, www.littlefiggy.com, and read about her Amish Friendship Bread journey. Check out her other amazing recipes, too!